Every year, around this point in the waning days of summer, I become very insecure about the garden. I figure for the first two years it was because I knew that I legitimately knew next-to-nothing about what I was doing, but enough to identify large areas for improvement. I was looking forward to expanding into new land, adding new vertical support, just starting the compost piles, building the hügelkultur bed, adding bees. It was a learning process, and I didn't expect much of myself or the garden...anything that happened was a success. The start of year three was, perhaps, an exercise in arrogance, then. For some reason, this spring I was feeling extremely confident. Two whole years under my belt and I was totally sure that I knew enough to really knock it out of the park in year three. Trellising in place, varieties selected that had been consistent winners the two years prior, a loose understanding of which parts of the garden got how much sun and held how much moisture, more compost, cover cropping. This year was slated to be a roaring success. We had done so much legwork to prepare for the time when we didn't have to remove lawn and till new space, when the trellises for climbing plants were in place well before they were needed, when we had started more than enough of everything that we wanted in March for good strong starts to be ready by May, when we had the tools we needed to do the work we needed to do, when winter eased off early. Okay, I thought, now this garden can live up to my expectations without me getting in the way! Everything is in place, now show me what you can do, nature! Like, way too confident, right? All of this thinking, of course, makes the fact of this year's inevitable late-summer garden insecurities only more intense. Funny, how nature has a way of humbling you over and over again. It's not that we had any catastrophes, really. Of course the weather has been weird, but that's every year these days, right? You can't just blame the weather for everything. Things got put out on time for the most part, things got enough water, no major storms destroyed the garden, hell, we didn't even have any kids rampage through or hungry strangers pillage the greens. But despite all of that, this year's late summer garden is a mess. Nutrient deficiencies are noted. The squash bugs do their work tirelessly, obviating the possibility of extra (or even enough) summer squash. The aphids, as always, thrive, dashing any hopes of Brussels sprouts this autumn. The weeds prevail. The bees are cross-combed and inaccessible. The ladybugs and lacewings released months ago seem to have left for other environs. At least the local sparrows and goldfinches are happy, with all of the weeds that have gone to seed. So why is the garden so ugly this year? Maybe I'm just learning more, and learning to see more nuanced areas of improvement than the last two years. Maybe, any output at all from the garden, after two years, isn't enough to inspire a celebration anymore (though, shouldn't it be?). Or maybe the garden really is ugly, and maybe that doesn't matter as much as it always feels like it does. At this point, I have a choice. I can write a meditation about how the garden is a reflection of the gardener. How, if I had been more mindful of myself this summer, the garden would be in better condition. How, if I had been tending my own garden, my own garden would have been getting tended, as it were. But then I started re-reading what I had written. I looked at the pile of eight(ish?) different heirloom tomato varieties sitting on the counter, some split, some bug eaten, some suffering from blossom-end rot, but all eminently, perfectly edible. I considered the half-dozen open tabs related to bird identification in my browser right next to the one where I'm typing this. I looked at the dried lavender on my desk. I considered all of the seeds that I've already saved from the marigolds and the poppies and the bachelors buttons and peppers and tomatoes and herbs. I felt the enveloping late August heat and humidity and thought of how long it had been since I last appreciated Queen Anne's Lace. I cut around the bad spots and ate another tomato. And then I decided that maybe expectations and insecurities and disappointment have a lot to do with one another, and even if a garden is a reflection of a gardener, maybe it's in ways that are a little more nuanced and a little more subtle than the yellowed leaves of a few squash plants and the number of weeds gone to seed. Maybe it's in the way the tomatoes and basil taste when they're still hot from the afternoon sun, and the way the bugs sing every night, the color of the new birds growing fat on grass and dill seed, the durable grace of the wildflowers, the volunteer winter squash outperforming their intentional peers, the dozens of varieties of seeds already waiting for next year's cultivation, the accumulated knowledge of another year's worth of gardening. My garden, like myself, is and always will be a work in progress. Some years there are things that go right. Surprisingly right, and you end the year tired of preserving zucchini and carrots and greens, freezer full. Some years a late-August storm flattens all of the corn and you mourn what was supposed to be. Some years the weeds grow high and still the carrots produce more than you need. Some days it feels like there aren't enough hands to do all of the work, and some days a whole army of hands shows up just to reassure you that you don't always have to do it all alone. Some years you find poison ivy in the garden and lose battle after battle trying to extricate the toxic weed from your life. Some years the slugs eat more of the cabbage than you do. Some years everything goes to seed, good and bad things both. And you know there will be more weeds to pull, because there are always more weeds to pull. But there will be more flowers and herbs, too. The work will never be over. There will be no garden, this year, next year, or twenty years hence where there isn't room for improvement, where, around late August, I see all of the current year's follies in stark relief. But there will also be no garden that doesn't teach me, yearly, something about patience, and expectations, and surprise, and the generosity of nature. If you've been keeping up with our Instagram or Facebook accounts (if you haven't been, what are you doing with your internet?! Get on it! 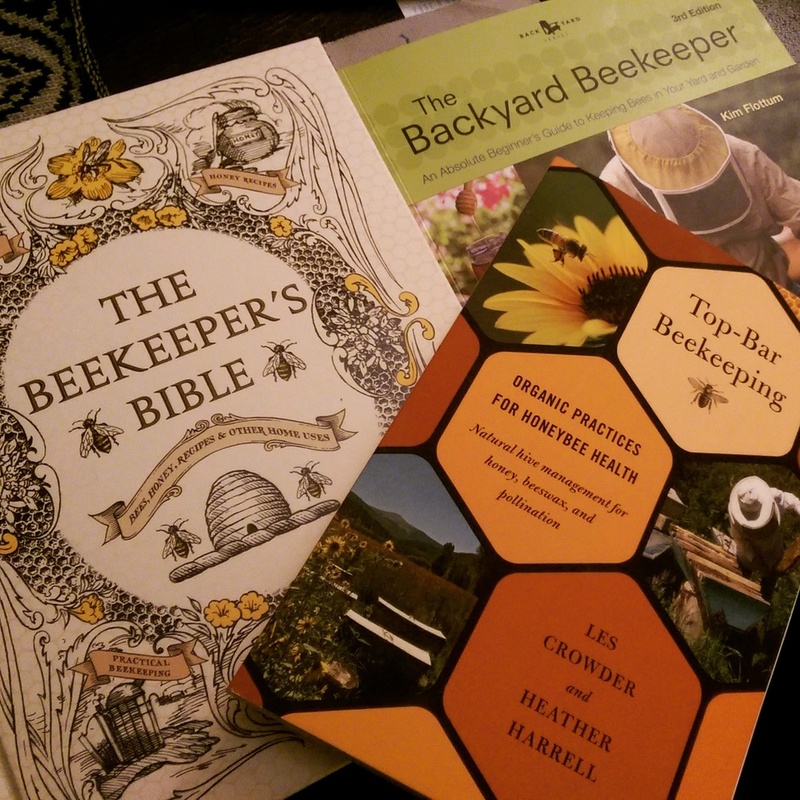 ), you are already well aware of the fact that this winter was primarily dedicated to one pursuit (beyond the standard artistic futzing, sewing, sanding, Airbnb hosting, cleaning, repairing, etc): preparing for the newest addition to The Homestead - bees! We've been dreaming and talking about adding animals to The Homestead since we began our endeavors here almost three years ago. Truth be told, I think we figured we'd already have bees and chickens and ducks and goats by now, but we're hardly ballers, and the foundations of responsible animal husbandry lay in providing a safe and comfortable environment for your new friends and farmhands, something that's proved a little tough to achieve rapidly when done on a shoestring. So, despite our burning enthusiasm for more than just plants, we've been taking our time, reading, preparing, scrimping, saving, and building. Nature doesn't really allow you to rush, and learning this lesson in the garden over and over and over again, we've taught ourselves to be satisfied (or at least to tolerate) moving at the pace that we can, instead of the pace that we wish we could, and after three years, we've finally taken our first step in diversifying the animal population here. As of a week ago, we officially have a happy mass of bees occupying the brand new top-bar hive that we knocked together in the basement. Having a superorganism as an addition to The Homestead is pretty neat-o, it turns out. Anyway, what's the worst thing that could happen? Thankfully, bees are really good at making do, and given a hollow cavity protected from the elements (even if it's not nearly as pretty or perfect as I would have it, given all of the money and time and carpentry skills that I lack), they will reliably do what nature has suited them to do very well, without my hand wringing. 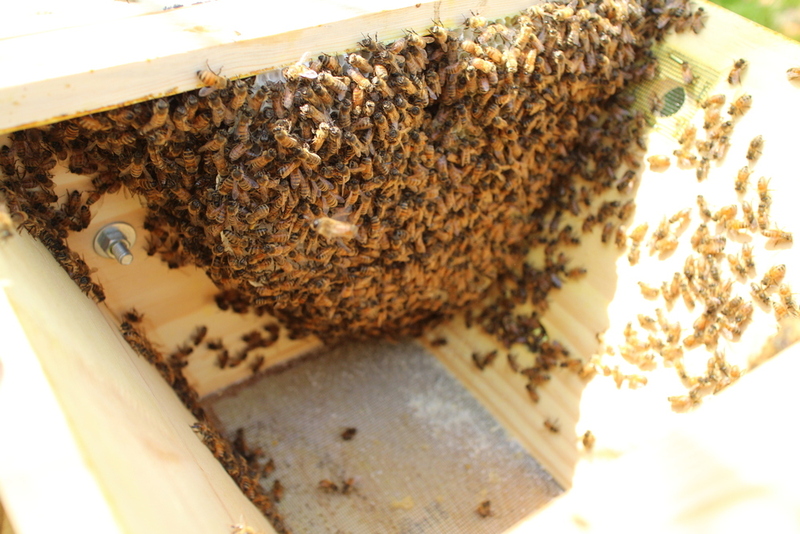 A week after dumping three pounds of bees into a hive that still smelled of sawdust and wood glue, there are combs in there, oriented the way that we had hoped they'd be oriented, and the bees seem to be multiplying. Neither I, nor Matt has been stung, despite my still learning to move slowly and deliberately so as not to crush any of my new friends (I have, and I'm still mourning the loss), and watching workers arriving back at the hive, so covered head to foot in pollen that they are weighted beyond their ability to move gracefully, is more entertaining than anything the internet or television has to offer, more life-affirming than an all-night dance party, and more adorable than your cat. We're doing things as organically and bee-centric as possible, which means no pesticides, using sugar-water spray as a distraction instead of smoke, no excessive messing around with them, no artificial food. We'll get whatever honey we get, and although we look forward to it, we're trying to not make that our end goal. Having a hive here is reward enough for us and the local biosphere, and anything short of hive collapse will be a roaring success for two people who had to make a veil out of an old hat and some window screen (not photographed....yet). In the meantime, we'll be taking a lot of photos, and trying to contain our enthusiasm for our new winged friends to manageable and only slightly obnoxious levels. Keep an eye out, I'm sure there's plenty more to come with this leg of the project.